St. Gregory of Narek, the great Armenian poet and theologian who lived at the turn of the second millennium, was far less of a household name than the Coptic Orthodox Church before yesterday’s official announcement that Pope Francis is elevating St. Gregory as a Doctor of the Universal Church. As Rorate Caeli and other outlets have noted, St. Gregory lived and died during a period of history where the whole of the Armenian Church was out of communion with both Catholics and Orthodox. Although several attempts at healing the Armenian/Catholic divide took place between the time of the Crusades and the Council of Florence, official establishment of the sui iuris Armenian Catholic Church did not occur until 1749—nearly eight centuries after St. Gregory’s birth. This fact has stirred up needless panic in some circles, with various accusations of papal chicanery being hurled at the Holy Father for allegedly breaking down the borders of the “true Church” to let in a “schismatic” who might very well have been a “heretic” because “schism” and “heresy” and “being the worst among sinners” are, in the minds of some, all part of the package deal you receive for not being officially Catholic. The recent—and again needless—controversy over the eternal status of the men I unreservedly refer to as the New Coptic Martyrs prompted some thoughts last week which, in part, took up the reality that numerous saints who are publicly venerated by one or more of the Eastern Catholic churches lived and died outside of the visible borders of the Catholic Church. I offered two examples: Ss. Isaac the Syrian and Gregory Palamas. Had I been a bit more searching about the matter, I should have added St. Gregory of Narek to that list as well. Any theological response to this query [over the New Coptic Martyrs] would have to take account of the fact that the calendars of “uniate” churches include commemorations of Saints who died without being in a state of full visible canonical unity with the See of Rome. These bodies include the (Melkite) Patriarchate of Antioch, the See of S Peter, whose Patriarch is, surely, the senior hierarch of the One Holy Catholic Apostolic Church after his Brother the occupant of the (other) Petrine See of Rome. 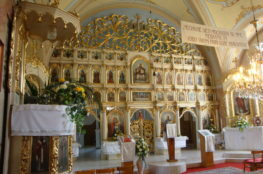 And any such response would need carefully to avoid any suggestion that Catholics not of the Latin churches are somehow not ‘real’ Catholics; or that the link between the lex orandi and the lex credendi does not apply to their liturgical rites to precisely the same extent as it does to the rites of the Latin churches. The matter doesn’t end there, unfortunately. As Owen White recently observed, there are those—including some very good eggs that I am in league with—who are “looking for clear and hard lines everywhere.” That is, they want to be able to say this is the Church; these are the people who are in it; and everyone else, though not necessarily damned, cannot be affirmed as genuine saints, regardless of the sanctity of their lives or the sacrificial nature of their deaths. I believe their instincts to be in the right place; there is just a far broader—and cloudier—historical-ecclesial horizon to take into account. Certain Catholics of a very traditional bent will have none of this, of course. They are self-assured in their belief that all non-Catholic Eastern Christians are schismatic heretics or heretical schismatics or whatever. A pity then that they may find themselves clutching their chests at my reminder that a certain pontiff known to be neither a renovator nor an ecumaniac, St. Pius X, granted toleration in 1908 to the practice of Ukrainian Greek Catholic clergy dispensing their faithful from the once-extant prohibition of communicatio in sacris with the Eastern Orthodox. Could it really be that St. Pius X was abiding a clear and gross violation of Divine Law? Or did this saintly pontiff, like the saintly Greek Catholic bishop who sought the Pope’s express tolerance, see a bit deeper into the nature of East/West relations than we, good Catholics of the 21st Century, are accustomed to? Some trads think the Pope is using the elevation of St Gregory of Narek to Doctor of the Church as a dry run for canonizing Martin Luther in 2017 (The 500th anniversary of the 95 theses). I think they are being paranoid and highly doubt Pope Francis would saint Luther. That’s an apples and rotten potatoes comparison. Gregory of Narek has been venerated as a Saint by the Armenian Catholic Church for over 250 years. Francis is not “sainting” him; he is already recognized as such. All that Francis is doing is taking a recognized saint of the Catholic Church and elevating his stature. Well, I wasn’t the one who said Pope Francis would do that. I was just relaying what I read some on trad fora believe is behind St Gregory being made a Doctor of the Church. I said I don’t think he will and some trads are paranoid. Sorry, I didn’t mean to imply that I thought you said it. I wasn’t trying to shoot the messenger, either. What, I ask, is defective about St. Gregory’s Christology? Does this joker have an argument, or is he just flailing in the dark? It’s “she,” but considering who the writer is you can be forgiven for making that mistake. The thing is, St. Gregory held what is, by all accounts, a strictly Chalcedonian Christology. If people want to root out heresy, they should start with the College of Cardinals, not an ascetic and prayerful man who has rested in the bosom of Christ for the past 1,000 years. I once asked an Orthodox priest what happened when two Orthodox bodies not in communion with each other restore communion with each other – did they have to accept those canonized by the other group during the time they were not in communion? I had ROCOR specifically in mind, and this was an OCA priest I was asking. As you may recall, I was not so keen on some ROCOR canonizations. So if, by that logic, these Eastern Catholic Churches came to Rome by way of a restoration of communion (or never left communion, as is the case with a couple of them), then it would seem their saints come with them. I think I agree with that logic. We should assume that these saints did submit, and would continue to submit (should different circumstances arise) to the valid authorities in those churches, and to the best of their theological, liturgical, and spiritual patrimony. Thus if we believe that the telos of the Armenian Christianity is communion with Rome, and that faithfulness to the Armenian Christian tradition is best witnessed in the communion of the Armenian church with Rome, then we should assume that those faithful to the Armenian ecclesial patrimony come with, and rest in the bosom of Petrine unity. 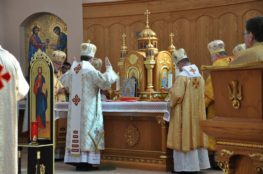 They were faithful to their particular tradition, and their particular tradition is now faithful to the full unity of Christ that rests in the Petrine office. Or that is how I might put it. A rather fair and proper sense and use of economy, all around. Thank you for this. I plan to plagiarize it without compunction going forward. What has occurred is rather significant, and many questions are involved. Rumination on such questions seems quite fair. It would be helpful, if someone could find some older, solid, standard book on such matters and scan it for us to access on the internet; perhaps tomorrow I will consult my Salaverri. Additionally, a sort of collection of papers by various theologians, all of whom believe that the “true Church of Jesus Christ […] is the One, Holy, Catholic, Apostolic Roman Church .” [I can supply the Latin from “Mystici Corporis” if someone wants.] would be excellent; the papers certainly could incorporate historical questions like the non-objections of Pius X concerning Ukrainian Greek Catholics. A similar collection appeared after the never published note of the CDF to the Pontifical Council for Promoting Christian Unity about the Nestorian version of the anaphora of Addai and Mari. I think that the decision of the CDF was wrong and scandalous and has led to sin, but there was theological consideration on it and theologians for and against it. 1) What does the status of being a doctor of the Church currently mean? How do we know this? Has this changed, explicitly or implicitly? 2) How do we know when an equipollent canonization has occurred? What note does such a canonization deserve; has the note changed from canonizations before Vatican II to those after Vatican II? 3) Because the Armenian Church was out of communion formally with the Catholic Church during the life of Gregory of Narek, can Pope Francis do what he did or has he exceeded the authority given by God? Such question is not disrespectful; for those who know Church history this type of question comes up more than rarely. Surely there are many others, but the asking and pondering these questions is fair, and the deference that my have been deserved at another time, I do not think is deserved now more than fifty years into a regime of novelty. (1) The title means less today than it used to — for a variety of reasons. The steady expansion of names has effectively watered down what it is to be a “Doctor of the Church.” Also, I knew several Eastern Catholics who couldn’t care less about the term since it doesn’t hold any special meaning for their tradition. (2) I am not sure I follow what you are asking here. (3) The title “Doctor of the Church” is just that — a title. The Pope could abolish the title tomorrow if he wanted to, though I think most would argue that it’d be highly imprudent for him to do so. The Pope holds the supreme teaching authority in the Church; as such he has the right to identify those who should be looked to as the Church’s supreme teachers. I’m surprised no one’s brought up the simplest explanation for all this, that it’s another cynical pat on the head of the eastern Catholic churches. An honor without privilege, meant to placate and nothing more. If that were true, it would have been someone less obscure and more widely venerated, like Gregory of Nyssa. Nah, he’s from the 4th century and not really identified with a discreet group like the Armenians. How would that mollify them? It is the 100th anniversary of the Armenian genocide. It is possible that was one of the reasons St Gregory of Narek was made a Doctor of the Church at this time. You know, that has popped into my head several times now, but each time I find myself writing about this topic, I forget to bring it up. Thank you for doing so. Ahhhh, yes that makes lots of sense. This discussion holds special interest for me because my older son, for some unfathomable reason, is fixated on Armenian history at the moment. He is writing his senior thesis on Armenian social history in the early Soviet period. Two semesters ago it was early medieval Ireland. Now it’s Armenia. Go figure. I guess that’s why he shouldn’t get his PhD. He doesn’t stay obsessed with one thing very long. I think I am pretty clear of these Trad cooties people are worried about — I’ve never even met a SSPXer, sedevacantist, Feeneyite, or what have you in the flesh. I attended at a Byzantine Catholic church for a year. Most masses I have been to were NO. The vast majority of my friends and family are non-Catholics. Out of pure self-interest I sure hope they have a pretty good shot at getting into heaven. I’ve always leaned on the whole Paul and the Unknown God thing and saw Catholicism as completing all the good in paganism and the philosophers and still vivifying that which is good in the sects that left her. But if someone clearly outside communion is to be raised as a saint for required veneration by the Universal Church, I just wish someone would have told me earlier that basically the Mere Christianity thing is right and just go out and live in whatever church and doctrines work for you. I could have saved myself some amount of grief and it would be good to know going forward. That is not at all what is being said here, and that’s a gross simplification. I don’t really have any issue with venerating the Copts as martyrs or St. Gregory Narek, but I too am annoyed with the “Mere Christianity” indifferentism- not found here but on many other sites that purport to be serious about Christianity. Given the state of American Catholicism, I can see people in this country pushing for Martin Luther King Jr. to be made a saint and doctor of the Church . Perhaps we should make Joesph Smith a Doctor of the Church too, for since his contribution to “religious liberty” and “family values” are so very important to the USCCB’s current campaign. Some of you sneer at Ann Barnhardt in a smug manner, but not one of you addresses the cogent points that she makes, especially the two principal ones, namely, first, that Gregory of Narek was a Miaphysite, and second, that it really matters WHO GOD IS. Miaphysites stress that Christ had a single nature and so are wrong about WHO GOD IS. The overall thrust of her excellent article argues the importance of the first commandment – pretty much a forgotten topic in our times. Except he wasn’t a Monophysite. This issue has been addressed in the literature and noted here as well. I didn’t say Monophysite. Do you disagree that he was a Miaphysite? I have no evidence before me that he was. What’s yours? There is considerable evidence if you care to look. One source is the Armenian Church itself. There are many other sources as well on the internet. as occuring during the Patriarchate of St Photios the Great of Constantinople, so sometime between 858 & 890. St Gregory of Narek was born within a century of this council, which rejected St Photios overtures and reaffirmed the rejection of Chalcedon. Prima facie St Gregory of Narek served in a church where Shirakavan was considered normative. And please let’s not have special pleading about a specific subscription to Shirakavan. One assumes that St Gregory subscribed to the normative teaching of his church. Would one require written proof that St Francis de Sales subscribed to Trent? In all likelihood they both subsribed formally to the normative doctrinal standards of their churches when they were ordained and when they were consecrated. This thread discusses Armenian Ordination anthemata. I have read that at one time they were especially lengthy. Someone who reads Armenian notes that they still include St Leo the Great and his Tome. They also seem to regard the usual “Miaphysite Father”, Severus of Antioch, as a heretic. There seems to be a cryptic mention of this under the Council of Manazkert in 719. Such a stance would put the Armenian Church, including at the time of St Gregory of Narek, beyond the usual non-Chalcedonian standard of “Oriental Orthodoxy”. I do not know if the Coptic and Jacobite churches and the Armenian church ever discussed whether they all accept Severus or not. I believe Fr John Meyendorff’s book “Imperial Union and Christian Division” addresses that in the 6th & 7th centuries the Armenian Church was formally more radical in its rejection of Chalcedon than the “Severian” position. So let’s not pretend that there is no reason one might conclude that St Gregory of Narek was at least formally in rejection of Chalcedonian definition. If some one wishes to prove otherwise, the burden of proof is on them. Let’s not pretend otherwise. I am not making an argument for or against any status which the Supreme Pontiff of the Roman Communion might bestow upon St. Gregory N. I myself find what writings of his I have had access to edifying. There are a lot of leaps here, particularly about what St. Gregory did or did not accept. The history of the Armenian Church is more complicated than you are letting on here. Moreover, the analogy of Trent is suspect given the differences in time, place, and purpose. You haven’t actually identified anything here; rather, you are making generalized claims about the Armenians and freighting St. Gregory with culpability. Not helpful. Also, a more helpful discussion of what the Armenians did or did not accept is contained in the Aidan Nichols volume I have cited in several places. It seems to me that a misunderstanding of Chalcedon was at the heart of its rejection in Armenia. But more importantly, I have seen no evidence that Gregory’s Christology was anything but Orthodox. Sorry, this is the link for a thread on anathemas made by ordinands in the Armenian Church. “Cite me something.” Sorry, not going to play that game. A little on my guard when someone cites Monophysite when I say Miaphysite. My answer is that if the Armenian Church itself claims to be Miaphysite and Gregory of Narek belongs to the Armenian Church, then … draw your own conclusions. What game? If I come on a blog or site making claims, I’m going to have evidence. You’ve provided none. Thankfully someone else has. Also, a simple reverse engineer reveals where you drew the “Miaphysite” claim — again, without supporting evidence. If you’re going to parrot other unsourced sources then try to play it off like you have a legitimate point, at least be honest about it. Deception is hard to pull off on the Internet.